Before starting to put clay on the bike, the “buck” has to be prepared, so the clay will have a secure, flex-free base to sit on. If you don’t have this, then it’s highly likely you’ll end up with cracks in the clay as the clay is quite susceptible to temperature changes. You also want to be able to sit directly on the model to check that the riding position is what you want, and that you don’t have bits of bodywork or whatever sticking out where they’ll bother you when riding. To do this, I used my ergonomics research that I’d done before using the Triumph Daytona 675 overlaid onto the frame of my SV650. With this I was able to come up with a reasonably good idea of the layout of the subframe that I needed to make, and then turned to Solidworks where I knocked up this drawing for a frame. 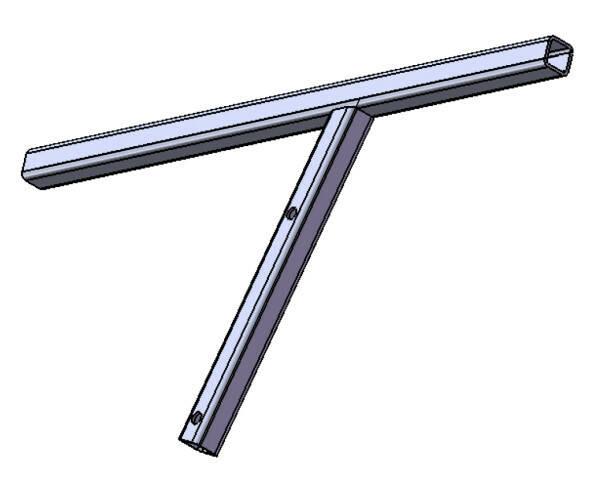 Given that this was my first time using Solidworks, I think it turned out pretty well! I then took this drawing around several fabrication shops in Munich, and came away with some astronomically priced quotes! It’s at this point I decided it was high time that I learn how to weld! A bit of local ebay sourcing, and I had myself a cheap MIG welder, for far less than the cost I was quoted for the fabrication. 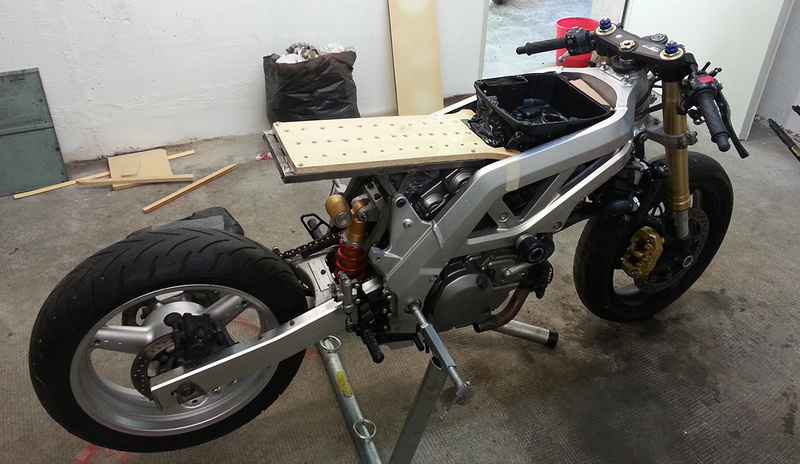 Fitting the seat subframe to the stock SV frame. In the end I was quite glad I undertook the fabrication myself. Not only was it far cheaper, I got to dip my toe into the murky world of metal work. Furthermore I was able to make a few design alterations, like adding a triangulation to brace it for when I sat on the model. At this point I also uprated the suspension at both ends. On my wife’s bike I had drastically improved the fork performance by installing cartridge fork emulators, but for my own bike I wanted to go one better. After extensive research, I sourced a complete 2007 GSXR750 front end and a Kawasaki ZX10 rear shock. Doing this of course also gave me awesome Tokico radial brakes! I was finding whilst sketching that by retaining the stock airbox lid, I was never going to achieve the look I wanted. I did some very unscientific testing on my wife’s SV with the airbox lid removed, and concluded that it could be removed without a major performance difference, but with the plus of a much more impressive intake roar! The exhaust system was also removed, since there was no way I was ever going to be able to use the stock pipe – way too quiet, long, big, heavy etc etc! 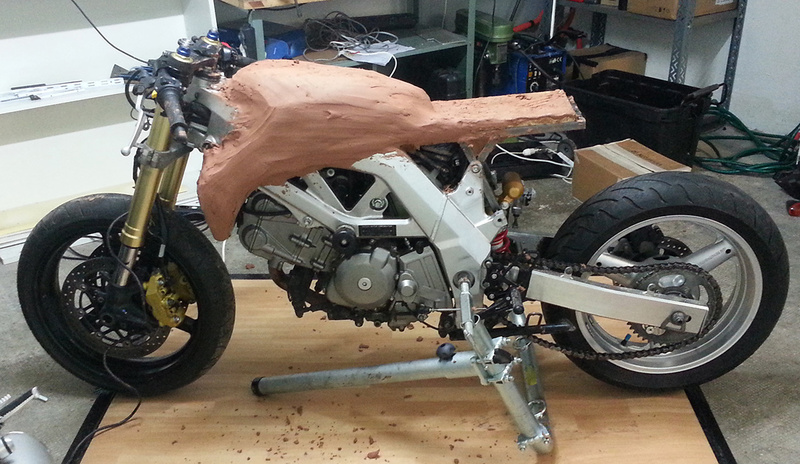 Following completion of the rear frame (note, this is only the frame for the model, and not for the actual end bike), and taping up all the loom and other places we don’t want clay to end up, it was time to load on the clay. I’m not sure how much you, my dear reader, know about clay modelling, so I’m going to write a little bit here to outline the process. Modelling clay comes in several guises, however by far the most popular across Europe’s OEM studios are Staedtler Light Clay and Staedtler Medium Clay. Light clay is physically lighter that medium , so should be theoretically better suited to doing a motorcycle since it makes the model easier to move around. However, that said, I far prefer medium clay. It’s personal choice of course, but I find it’s got a much nicer texture, and is far better at adhering to clay that is already on the model. Light clay seems to stick to everything except for itself! Incidentally, if you ever want to tell the difference between one lump of clay and another, light clay floats on water, medium clay sinks. Modelling clay behaves rather more like a wax than it does “traditional” clay out of the ground. If you heat it up, it softens, and as it cools it hardens. It can be repeatedly heated and cooled indefinitely without affecting the clay in any way. The temperature at which the clay becomes sufficiently soft to smear on top of other clay is roughly 60°C. The base clay also needs to be heated to this temperature by using a hot-air gun, to ensure good adhesion between the layers of clay. Below you can see the clay being built up gradually. I’m a great fan of salvaging waste, so fortunately I have several boxes of Medium clay that I salvaged from the floor of the CNC mill, following the milling of a Rolls Royce – Hopefully it should keep me going for a while! After the clay is loaded up, it’s time to start going at it with clay tools. These are relatively rudimentary hand tools, that largely consist of rasps (regular flat and curved rasps from the hardware shop), rakes (contoured blades with a handle, resembling a miniature garden rake) and slicks (shaped spring steel of varying thicknesses, normally 0.1mm-1mm). There are several other tools that a modeller uses from time to time, but I’d say 95% of the work can be done using these aforementioned tools. 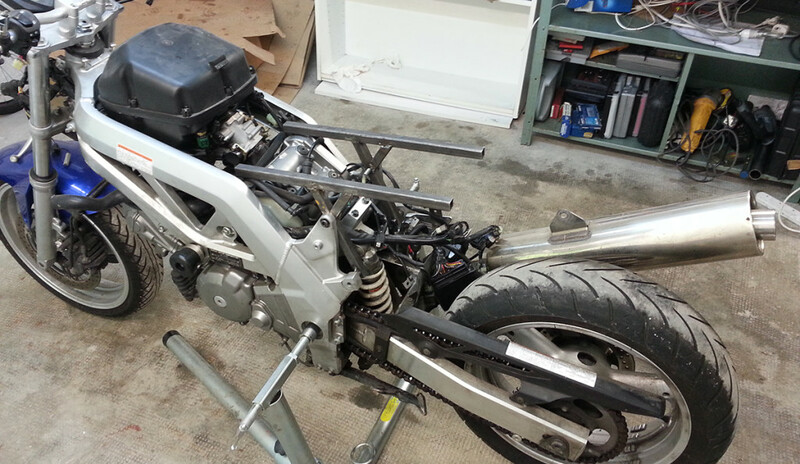 The bike is sourced, stripped and in the new workshop. 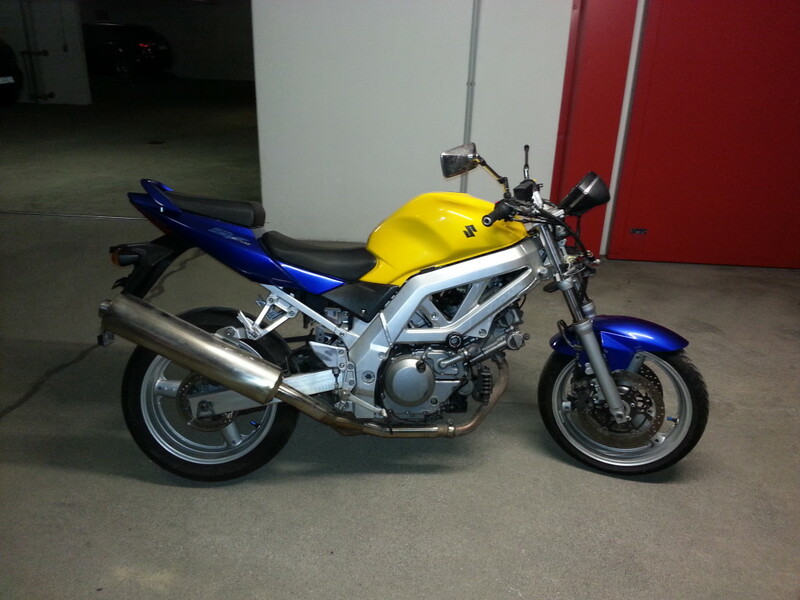 In the last couple of months I’ve managed to source a 2003 model SV650 in reasonable condition in Stuttgart from ebay. Only problem was that it as in an unrideable condition and I don’t have a car let alone a van! Fortunately I found a UK based courier company that would bring it from Stuttgart to Munich for the princely sum of 100 EUR. Bargain. And here she is in all her pre-stripped down glory. The main problem was not having somewhere to work, and I was using in a friend’s underground parking space while I managed to find a suitable workshop space in Munich (no easy task!). 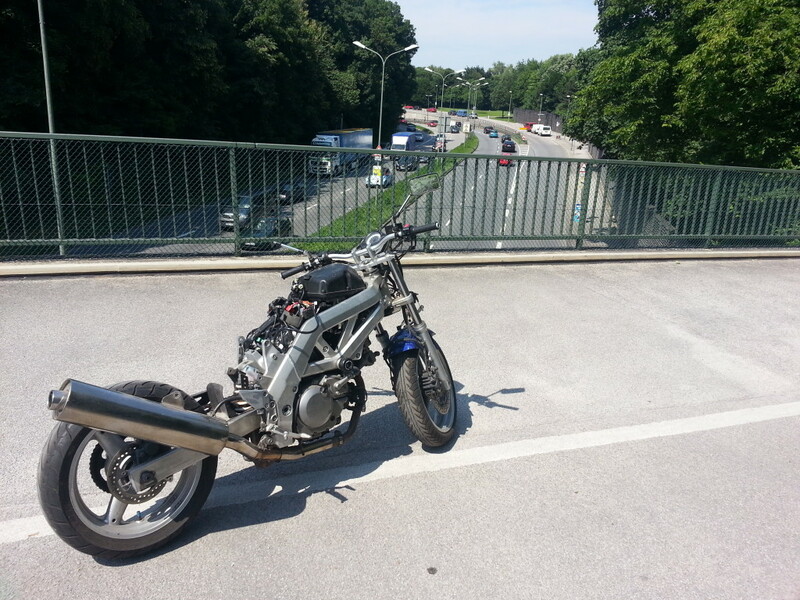 Finally one was found not far away, so I signed the lease and pushed the semi stripped down SV650 over there. Our new home from home! 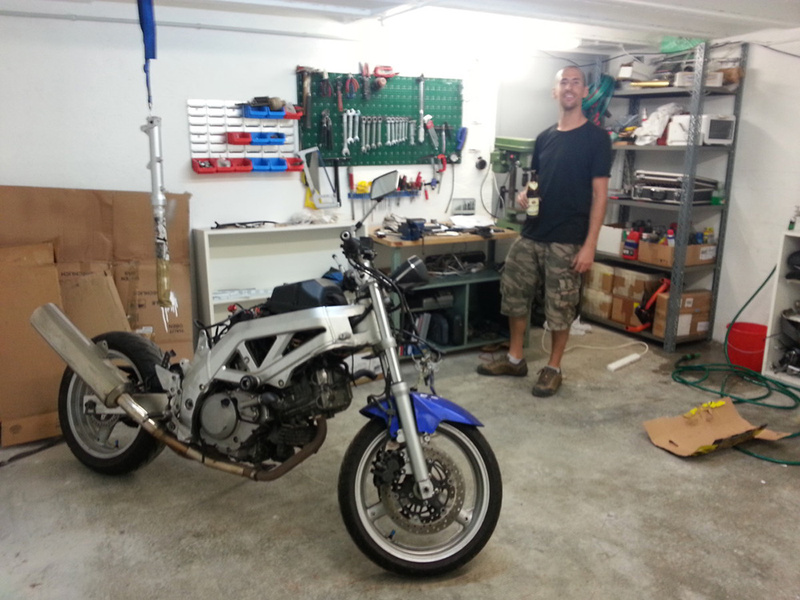 Me and the SV650 in the workshop before work commences in earnest!